Search has become an integral part of using the Internet. Facebook’s search is also important, though it works a bit differently from the way a search engine like Google or Bing does. Instead of just looking for the best match for what you searched for, Facebook tries to give you a way to explore the best your friends have to offer through what Facebook calls Graph Search. Graph Search is named for the web of connections between you and your friends that is sometimes referred to as the social graph. Graph Search allows these connections to be surfaced to you in interesting ways. On the most practical level, this is why when you search for a friend with a common name on Facebook, the top results will be people with the same common friends as you, or people in your city, or from your hometown. Search doesn’t just look for people with a specific name; it looks for all the connections that might matter in a search. What’s cool about Graph Search is that it allows you to discover new and interesting things through search. For example, you can search for “Restaurants my friends like in Seattle” and see all the restaurants in the city that your friends have taken the time to like on Facebook. You can search for “Photos of my friends” or “Music my friends like” to discover content you might not know about. To use Graph Search, start typing something in the search box in the big blue bar on top. You might try something like TV shows my friends like. As you type, Facebook actually recommends several different searches. For example, if you type “TV shows my friends,” you could actually search for your friends’ favorite TV shows, the favorite TV shows of people who live near you, the favorite TV shows of people who like the same science fiction blog you like, and so on. When you pick an actual search, Facebook shows you the results in a list. You can then refine the search using the options on the right side of the search results page. Depending on the type of search, you may have different options for both refining and expanding the search. The search refinement box gives possibilities for changing your search. For example, you could search for restaurants in Seattle. In addition to the map of locations, you can narrow the search to a certain type of cuisine by clicking the Category drop-down menu. 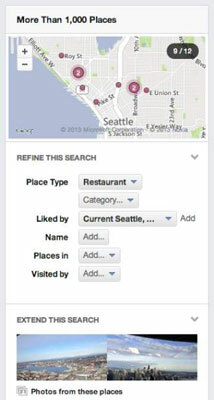 You can add a Liked By category so that you see only restaurants that people in Seattle like and that you and a friend like. Additionally, you can expand the search to look at restaurant photos. If you want to search for something cool but don’t even know what to search for, click the Discover Something New link found at the bottom of the search refinement box. Facebook will generate a random search, and you might just learn something cool about your friends or about yourself. Although Graph Search is interesting to play with, you may find that more often than not, you’re using the search bar to get quickly to someplace on Facebook. You might want to hop over to a friend’s Timeline to leave a post, or you might be trying to remember what time that particular event is. In both these cases, simply typing the name of the person or event into the search bar will bring up the correct results. Facebook autocompletes as you type, and before it recommends complicated searches, it usually recommends a person, Page, group, or event that you are likely to be looking for.